Great buffalo scraps for use in many projects. Kids love these too. 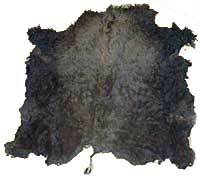 These are the trimmings from the edge of a hide after it is finished into a perfect buffalo robe. Most pieces average about 1-5 feet long and 1-8 inches wide. Fur length varies depending on the piece. Sold by the pound. Please note that we will try provide the exact amount you specify, but the weight of various pieces varies greatly. The amount you receive may vary by 10% or more (you will be charged more or less, accordingly). These are great buffalo horn caps that average 14 inches long (measured on outside curve). They are not cleaned or polished and are in their natural state. Buffalo horns were traditionally used to make spoons, ladles, and of course, for buffalo horn bonnets. Note that most split-horned bonnets only require one horn. The horn is split in half (almost quartered, really) and then shaped and polished. A trick to make these really nice and shiny is to use sandpaper to smooth them down. Once the outer layer is worn off, use successively finer grit until you are basically polishing the horn. When it is completely smooth, apply a layer of animal fat or vegetable oil and polish into the horn. It will take on a beautiful deep black luster. Just a helpful hint (we know this works because that's how we made a horned bonnet). Please note that we do not have these horns available in matched pairs. We buy them in bulk and get an assortment of sizes, lefts, rights, etc. Also note that these are fairly rough on the outside. Buffalo are an aggressive animal and grind their horns regularly against trees and other objects. If you are trying to purchase a horn for use as a powder horn, please be aware that these horns are not smooth. They may have gouges and other rough areas. Please DO let us know your needs and we will certainly try to select appropriate horns. We just can't promise that we'll have horns that match your specifications. Our buffalo robes are perfect for use as a robe, bed cover, or to just curl up on to read a book or watch TV. We have one of these spread on our living room floor and it makes a nice place to sit and watch TV or play with our kids. Note that the actual robe may differ from the one illustrated as each is unique. Commercially tanned. NOTE: This is an oversize item for shipping purposes and may incur a higher shipping cost than estimated by our web site.